Location: ExCel London Exhibition Centre, ExCeL London One, Western Gateway, Royal Victoria Dock, London, E16 1XL, UK. It's January, which would normally mean we'd be at the Earl's Court Exhibition Centre for the ATEI show. However, things have changed a bit this year. 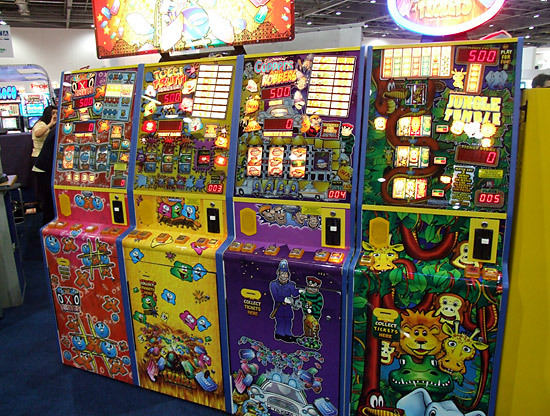 Over the last few years, the Earl's Court show has drifted away from amusements and towards gaming. The amusement machine companies were moved upstairs and slots, roulette, poker and payout machines took over the ground floor. 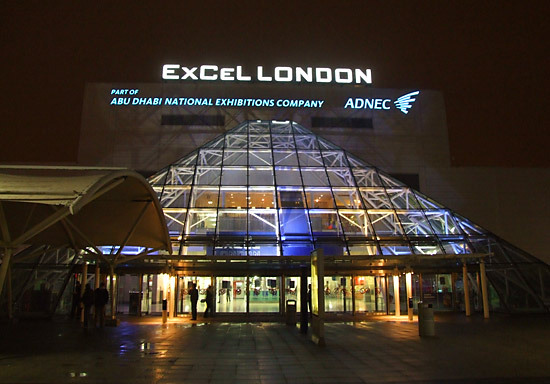 Indeed, the show now held at Earl's Court is billed as "International Gaming Expo 2010 incorporating ICEi, The Betting Show & ATEI". One look at the floor plan shows how ATEI has all but disappeared. It was a shift in focus we noted and lamented at the time, but it seems we were not alone in regretting the diminution of the amusements section at ATEI. 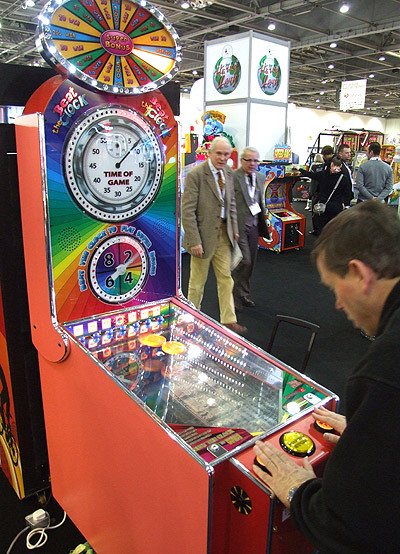 BACTA, the trade body representing the amusement trade in the UK decided to set up their own show to cater for amusement manufacturers and distributors. EAG-Expo ran alongside ATEI, but was held 13 miles east, on the other side of London at the large Excel centre in the Docklands area of the city. We visited the show on its second day of three and although undoubtedly quieter than the Earl's Court version had been, it looked impressive and filled the available space well. As they say, it's not the quantity of visitors that counts, it's the quality. If the journey to East London discouraged some of those who previously visited just to play the games, it may not be a bad thing. 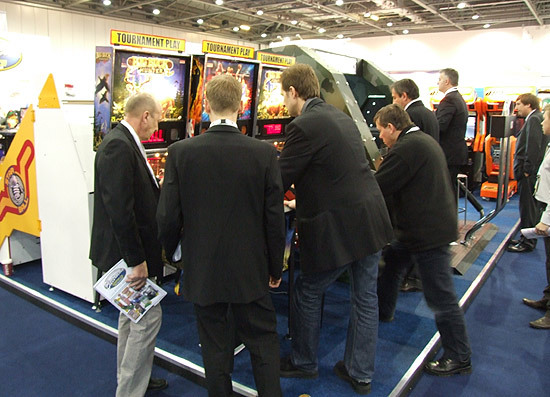 But we were at EAG-Expo to check out the pinball situation. 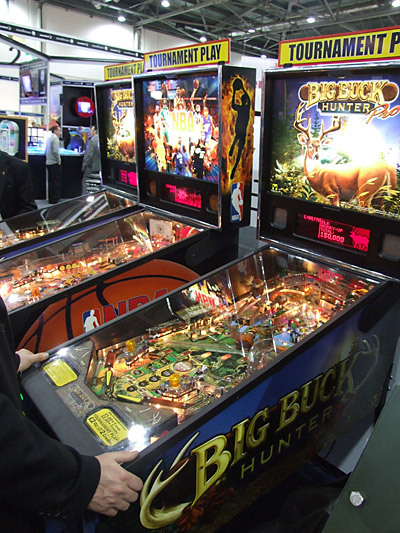 As expected, it's pretty meager these days but Stern were well represented on the UK distributor Electrocoin's stand with a location on the main thoroughfare where they were showing their new Big Buck Hunter Pro machine. There were two of them set up for public play, where they were joined by a single NBA machine. All three were kept pretty busy all the time we were there and Gary Stern could be seen wandering around talking to visitors following his appearance at the South Coast Slam a few days earlier. Having two BBH machines gave us the opportunity to compare how they played. Both were pretty brutal in sending balls down the outlanes but they differed quite significantly in the force required to register a shot on the buck. One only needed a slight tap - even registering shots from the back - while the other needed a much more powerful hit, ignoring anything less than a full power direct shot. There were no flyers available for BBH at the show. As usual, we had a look around the show for other pinball-related products. The most interesting was this Beat The Clock combined pinball/air hockey redemption game from Harry Levy. 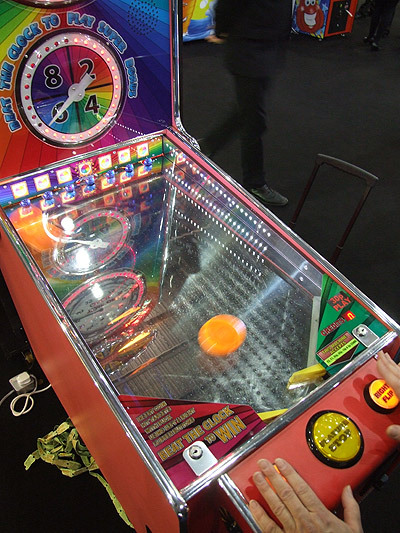 Available as a single or multi-piece unit, the game uses standard pinball flippers (without any rubbers) to flip two flat plastic pucks around a small air hockey table in order to hit a row of semi-spherical standup targets at the top. The advance the player's clock by a certain number of seconds and if the clock is completed before the game's clock, you enter a bonus round to win lots of tickets. It's a challenging game and surprisingly fun - for a short time at least - trying to reach the bonus round. It took us around a dozen games to finally get there. Beat The Clock was the only new pinball-related product we found this year. 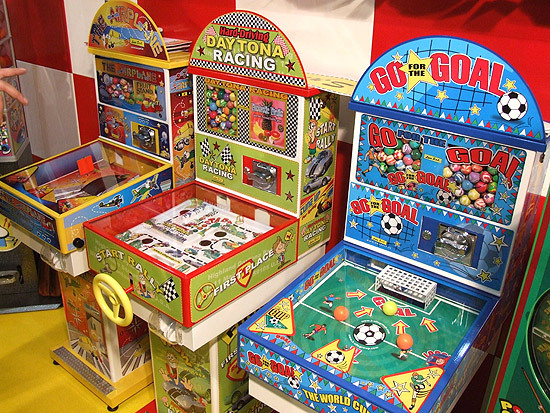 Other games such as the horse racing-based Turf Champ which we featured last year and this selection of small prize dispensers featuring flippers and even a small ramp on the playfield. Although this was an amusement show and not a gambling one, there were still plenty of slot machines (also called fruit machines or AWP - amusements with prizes). Rather than paying money though, these dispensed redemption tickets which does seem like an attempt to get younger players familiar with gaming machines. 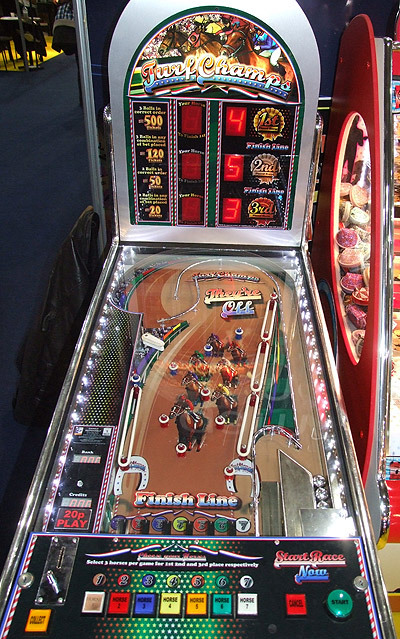 It does show how redemption is still very popular and an area Stern might re-consider to introduce youngsters to pinball-style games at an early age. Was EAG-Expo a success? 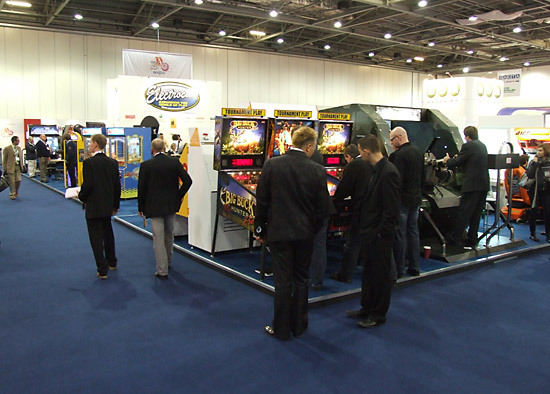 Well, visitor numbers were clearly down compared to the Earl's Court event last year, but then reports suggest the same was true at ATEI and the associated gaming shows where the upstairs area was unused, so perhaps that's the state the industry is in as we climb out of recession. EAG-Expo's dates for 2011 have already been announced, but whether there's enough interest in two competing shows in the long term remains uncertain.